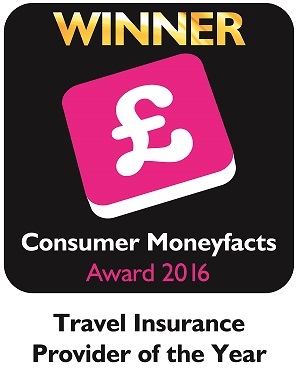 I am delighted to announce that Holidaysafe has been voted Travel Insurance Provider of the Year at the 2016 Consumer Moneyfacts Awards! This is the second time that Holidaysafe has won this prestigious award, taking the 2014 and 2016 titles. Now in its sixth year, the Moneyfacts Awards aim to highlight the best financial products available to the general public. To do this, the Moneyfacts experts assess the products of each provider, and combine their technical feedback with customer reviews. The 2016 event took place on Thursday 21st January at the Jumeirah Carlton Tower Hotel London, where it was officially announced that Holidaysafe had been voted Travel Insurance Provider of the Year. Holidaysafe beat leading names LV= and Insure and Go to the top spot; they came in second place (highly commended) and third place (commended) respectfully. This accolade means that the Holidaysafe policies have been assessed, and found to be the top products available in the entire UK market, based on travel insurance cover, price and customer satisfaction. The Holidaysafe team are delighted to add this award to their collection, along with multiple features in the Which? Best Rate tables from 2010-2015. Holidaysafe launched in 2006, and has since gone from strength to strength, with an increasing team and a growing range of specialist travel insurance products, including Single Trip, Multi Trip, Winter Sports, Longstay and Backpacker plus many more. If you’re interested in finding more information about Holidaysafe and the range of travel insurance policies available, visit Holidaysafe.co.uk.